Always one to try something new when I see it; when I discovered a box of Freekeh on the shelves of Bristol Sweetmart the other day, I couldn't resist buying it. Freekeh is a roasted green wheat which is particularly popular in Palestine, the Arabian peninsula and Egypt. According to Wikipedia: "The wheat is harvested while the grains are yellow and the seeds are still soft; it is then piled and sun-dried. The piles are then carefully set on fire so only the straw and chaff burn and not the seeds. It is the high moisture content of the seeds that prevents them from burning. The now roasted wheat undergoes further thrashing and sun-drying to make the flavour, texture, and colour uniform. It is this thrashing or rubbing process of the grains that gives this food its name, farīk or “rubbed.” The seeds are now cracked into smaller pieces so they look like a green bulgur." The initial plan was to make this as a vegetarian salad, but a surplus lamb shank changed that plan. Buying three of any piece of meat usually proves difficult as the store normally packages them in twos. Although shanks were available to buy singularly at the butcher counter, they were much smaller and looked inferior. 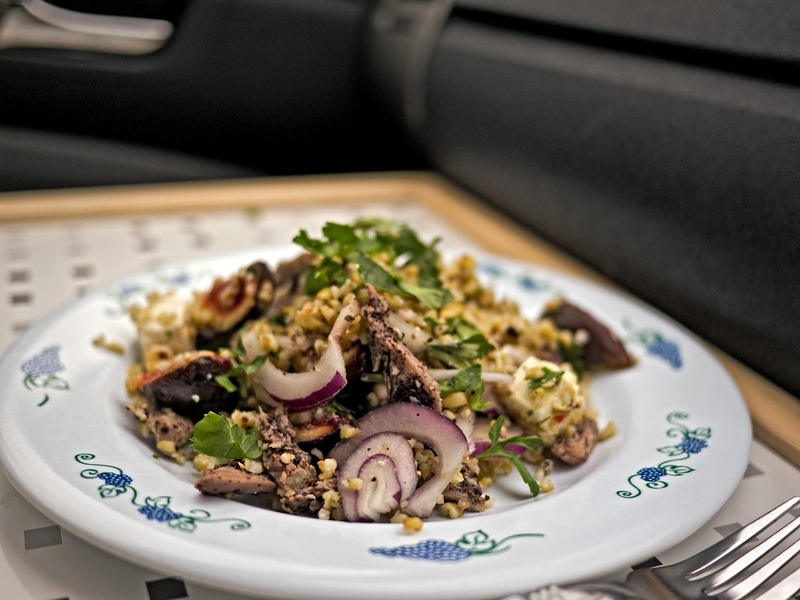 This recipe would work equally well with other cracked wheat such as bulgur, or even couscous or rice. Cut the cooked lamb in to small slivers and coat with the sumac. Leave in infuse for a while. Cook the freekeh in plenty of salted water for 30 minutes or until cooked to your liking. Mix together all the ingredients and serve. This was a great salad to take for a car picnic today, although I did carry the feta cheese and parsley separately and mixed in just as I was serving.